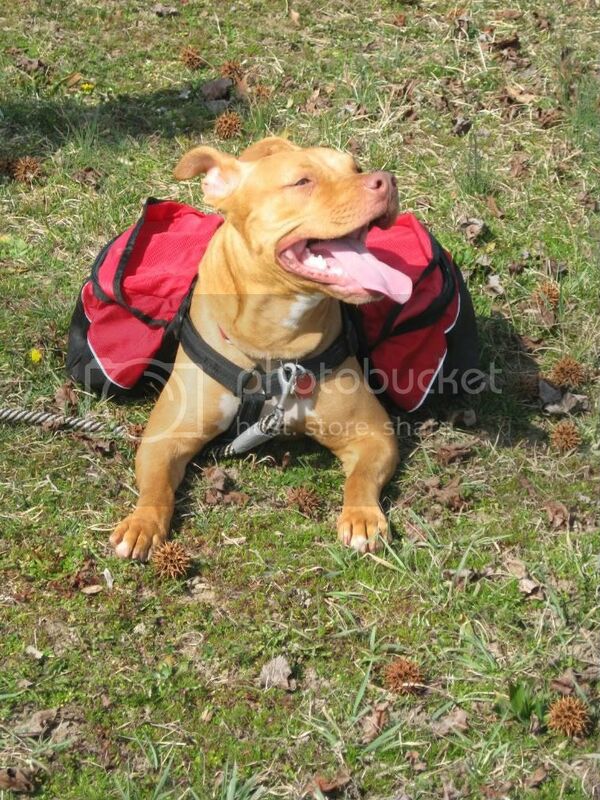 I finally got some pictures of Roxy in her backpack so I thought I would share. She loves it. I had to get the Small size because she is small for her weight (60 lb). So cool, I can't wait till I get to use back packs. AT what age u should start? I think the general consensus is wait until they're finished growing (at least skeletally) before making them carry any real weight. I think there are other threads about this out there.. maybe do a search. Weightpulling guidelines probably apply to backpacking as well. Thanks for this topic! We are huge Cesar Millan fans ( ) and when we adopted Maya, one of the first things we purchased along with a leash, collar, crate, etc was a doggie packback. 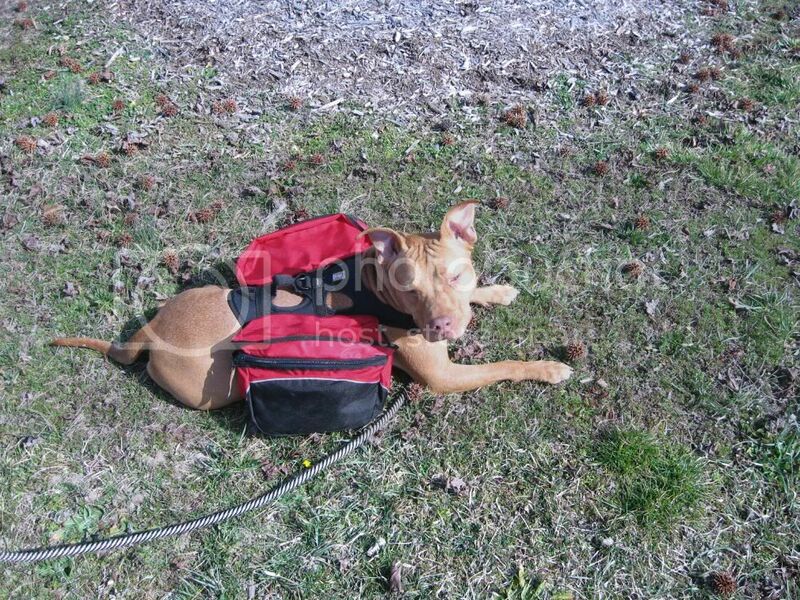 We trained her with it from day one because Millan said this was a simple way to give a dog a job (mental exercise) as well as increase the physical exercise.. She now carries a bottle of water (20 oz) on each side of the backpack along with extra poopie bags. We did not however, do good research on doggie backpacks and ended up with one that doesn't fit her well. Since it's more important to us to get her into weight pulling for example, we're putting off purchasing a better one for later. Does anyone have any tips for backpacks that rub at all? Here's a pic of Maya in her backpack getting a huge drink of water from the cooler. Sorry to bring this back from the dead but where did everyone get their pack and what kind is the best?? This isn't the greatest pic, but here's one with Cash and I... and his backpack! We got it about a week before this, and were very careful about not wearing Cash out - in fact... on this 2 hour hike, I wound up carrying it half the time due to the rougher-than-expected terrain. I still use it today- a chance to wear him out on his walks and preparing for the inclement weather soon to come. I usually put a water bottle in each side. I however, hear differently when it comes to weight carrying- that dogs should only carry 15% of their body weight... so I try to limit Cash to less than 15 lbs. Boss weighs about 70 pounds. 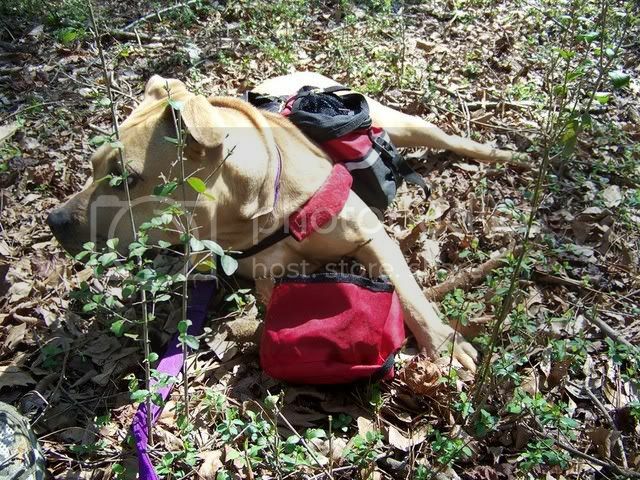 He carries a small food log, a collapseable water bowl, a few dog discuits. Also some ear cleaner and a spray bottle full of peroxide. Somtimes my car keys. Often about 3 boiled eggs for a treat. I carry a gallon of water or two [A grown man and a ptibull can consume alot of water. ], some fruit, about 3 granola bars. Myabe a foot long turkey sandwich. I also carry a compass, a watch and pepperspray in a vest. Maybe a knife. We usually go out in the morning and we can stay damn near all day depending on the weather. Boss and I can hike and mess around in the woods for 5-7hrs easy. We'll start early and take a break if it gets too hot. When it cools down, sometimes after about an hour or two, we start back walking. If its still hot I'll attach Bosses back pack to mine and carry it for him. One time we sat by a pond too long and it was almost dark before I knew it. We pretty much jogged a mile and change with our packs. It kicked our butts but it was a good experience. Lunchbucket wrote: Sorry to bring this back from the dead but where did everyone get their pack and what kind is the best?? 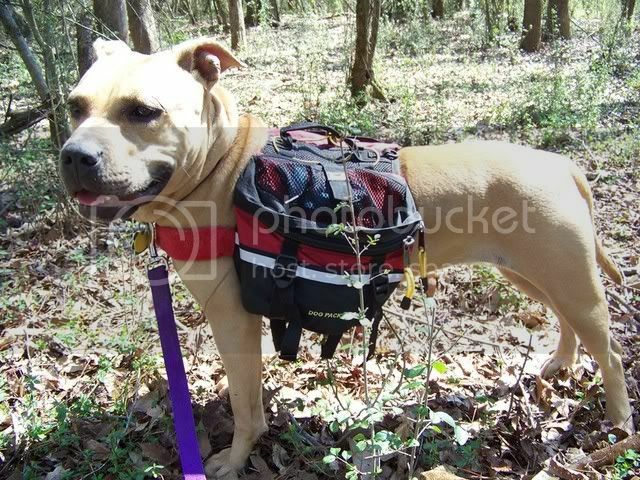 ruffwear makes a exellent pak!!! they fit really nice its worth the money!!! wow he's a big boy my Doc is 9months old now and he's 63pounds. his backpack is large it said from 60pounds to 130 it helps a bit he's very hyper. Thanks I'll look into them! I go backpacking a lot with my dog Vegas. i have a had 3 packs a petsmart one, kelty chuckwagon, granite gear. The petsmart one was tore after bouldering through southern utah desert. The kelty chuckwagon was great I loved the straps and how it was setup no bad comments on this one. The one I like the most is her granite gear pack. It has been through a lot not even one hole yet. Simple design light, fleece lined, straps on the back to lower and raise side pouch and no rubbing. I would attach a photo but its kind of a pain. Try them on your dog. I recommend the kelty and the granite gear both have held up well. Me and my dog Chance also backpack. The first time we did it he had to take two breaks. But now we bike more. i LOVE harvey's backpack. it's the ruff wear approach II pack. SO WORTH the money. i got it on Gear Trade.com- not used, but had been tried on by another dog. I got it pretty cheap. my roommate just took him for a walk without it yesterday, and with it today and she said she will NOT take him out without it again because he is SO MUCH BETTER with it on. he carries our poop-bags (empty and full) and two one liter bags of iv fluids for weights.